While I’ve been getting great results from the single-pass printing designs that I’ve been doing, I really want to be able to express myself with more complex designs. The reason I was learning about transparent ink is so that I can design art with multiple layers. 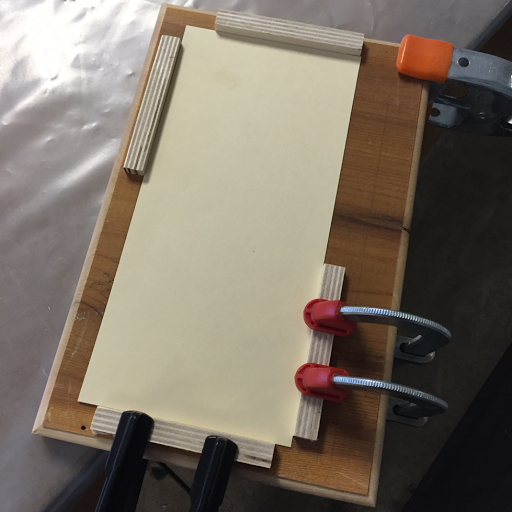 Because I’ll be building a physical tool, called a jig, to help me with registration, I want it to be as useful as possible. I’m designing a card to fit the remade envelopes that I have, and then I’ll place the artwork on the front flap of the card. After deciding what size the card should be, I need to figure out how to cut them out of the full sized sheets of acid-free printmaking paper that I have. You’ll notice that I’ve added an extra one and a half inches to the bottom. If this method of registration doesn’t give the results I want, I’ll try another one that requires a “waste” edge to be cut off later. After deciding what size I will make the pieces of paper to print on, I found a board that would hold them. It happens to be a sign blank that I never carved. It’s probably too thick to go through the press when I get one, but it’s good enough for a quick test of this registration method. 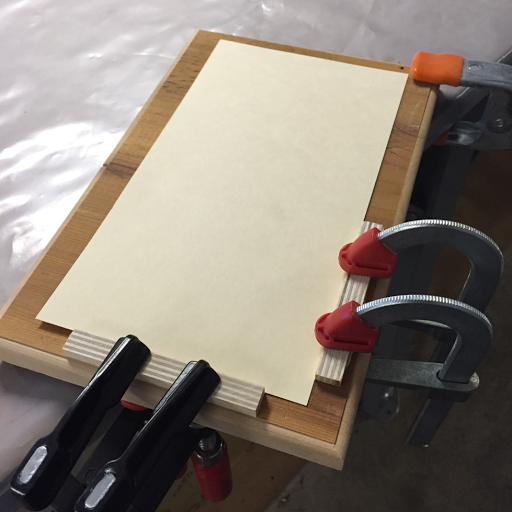 I placed a correctly sized piece of card stock on the board and used it to line up and glue down some edge strips. Later on, I’ll put the paper up against those strips to get it in the same place on the jig every time. 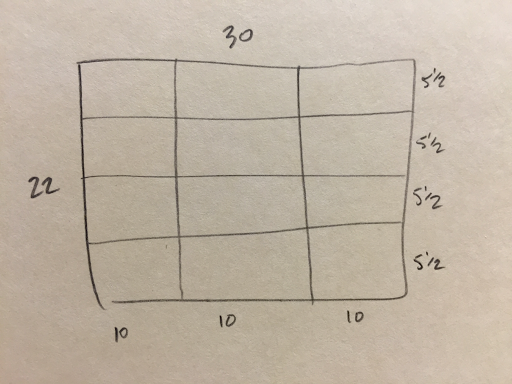 The next thing I needed to do was to calculate where the block would sit in relationship to the full-sized piece of paper. 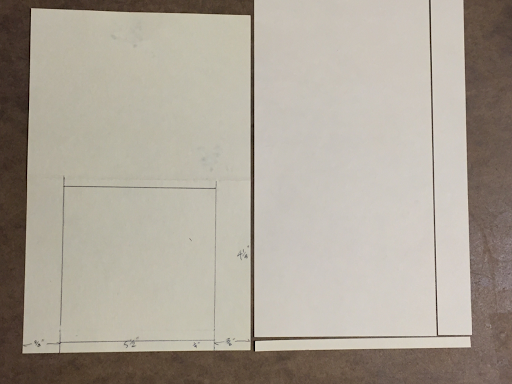 I did the calculations on a correctly sized piece of card stock, and transferred them to the extra long piece. I cut off the pieces that would lie outside of my printing area. 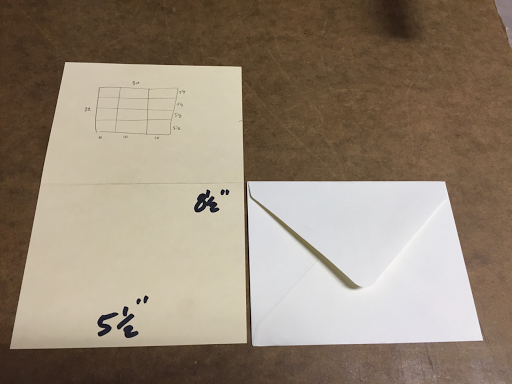 This placed the far corner of the block into the correct relationship with the corner of the paper. 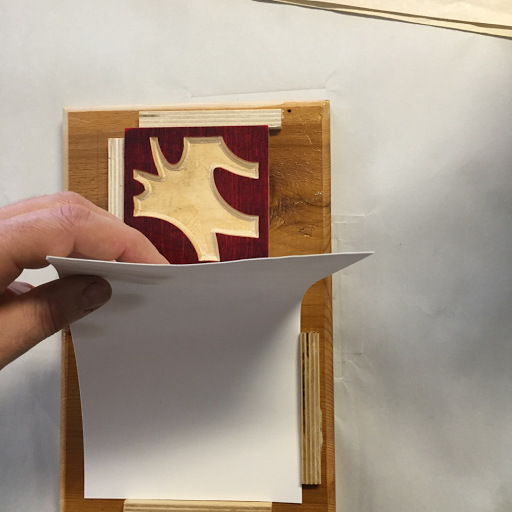 I then used that piece of card stock to place the block corners and glue them down. Then, since I’m still wetting my paper to make up for the lack of a press, I need to make sure that the wood surface doesn’t stain my paper. 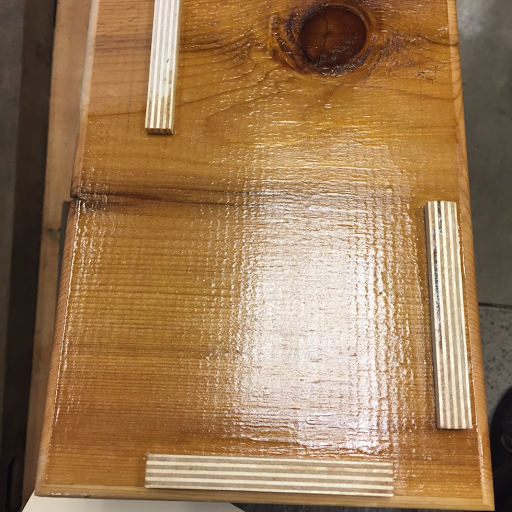 I gave it two coats of shellac and let them dry. And, finally, I’m ready to use my jig to place the blocks and the paper in consistent locations. In my next blog post, I’ll show y’all the results of this little jig.